So, you are a homesteader or a wanna-be looking for a low-footprint, minimal-labor technique to grow tasty, nutritional, organic food? Are you also searching for different avenues of generating a steady income on the homestead? You’ve clicked on the right article. Many of you may be familiar with hydroponics: the growing of plants in water containing artificially introduced nutrients (many times chemicals, unfortunately). However, some may be less familiar with bioponics. Bioponics (sometimes called aquaponics when fish are involved) is a term that describes a biotic (living) system consisting of sub-systems that aid and compliment one another’s living and growth conditions without chemicals. You’re going to learn to construct such a biosystem in this article. In this case, we’ll be working with plants and fish. The fish are grown in a tank (or tanks). The nutrients contained in the waste (waste to the fish anyhow) is pumped off with water from the tank and used to nourish plants naturally in a growing bed. This second sub-system cleans and filters the water and adds it own nutrients which is pumped back for the fish to use and again replenish for the plants. Add a little light for plant photosynthesis, a bit of food for the fish and everyone is happy, especially your friends and family when you serve dinner. This biosystem is not hard to construct on a small-scale basis, as it can consist only of a small bed of plants and a tub of fish housed in something as simple as an aquarium, a washtub, or a 55-gallon drum. Conversely, there are many producers who do this commercially with an elaborate array of very large tanks and many beds with plants of varying species all plumbed together. Here at Mid America Renewable Energy Center in New Bloomfield, Missouri, we have been producing food in biosystems for a number of years. We raise Tilapia fish and for good reason: they tend to thrive in this environment with little care as they are hearty critters that tolerate even poor water conditions well. They are also a tasty, popular fish and easy to market around the world (chefs love them). Further, they are vegetation eaters that will eat virtually any plant cuttings you want to throw at them. This includes algae. The latter is very important because one byproduct of this system is a large amount of algae that will begin to grow in the fish tank. Indeed, Tilapia gill rakers can scoop up anything larger than 3 microns (about the size of a red blood cell). This ability makes them voracious algae eaters and, if your system is operating properly, they should keep their water so clean and clear that you can see a dime lying on the bottom of the tank. But, although they eat algae, in most systems you must also supplement their diet with high-protein fish food introduced from outside the biosystem. Many growers use Purina Aqua Max 41% protein fish food or a competing brand for this purpose. A good judgment of how much additional food to feed your particular crop of fish in traditional systems is gleaned from experience. There is no way for me to tell you this, as I would have no way of knowing what size system you will build, the size of the tank you will use or the number of fish you will place in it. Therefore, the amount of algae it will produce is an unknown. However, one way to know how much supplemental feed to use is to observe the algae produced in the system that remains uneaten. Are you starting to see the beginnings of what biologists call an “algal bloom” forming in the fish environment? You are feeding them way too much supplementary food and they prefer that over the algae. Is there no hint of algae at all on the sides of the tank? You are not feeding them enough. It’s that detectable hint of algae present that tells you all is in balance and your fish are happy. But you don’t have to go with a traditional system to begin with. Why not allow the biosystem to produce 100% of the fish food? Algae is a very high source of protein in itself and quite nutritious (even for people). Some species consist of 70% protein and today people are experimenting successfully with introducing certain algaes such as Spirulina (60-70 % protein) and even non-algal plants (duckweed comes to mind) into the fish tank to grow along side the fish as their only source of food. The fish tank consists of whatever you decide to use for one. A sump pump (usually, but you can use whatever type water pump you may have on hand) is placed about an inch off the floor of the tank to take advantage of available fish waste, which tends to accumulate at that level. 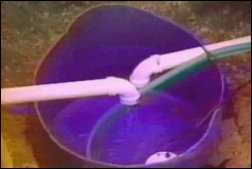 A pipe or tubing (one-inch PVC pipe works well) is hooked to the pump and the water pathway is plumbed to the growing bed. The growing bed can be constructed of anything that you have laying around. Most use plywood and 2x8s, untreated of course, as you don’t want anything in your biosystem that will kill or sicken the beneficial bacteria that make the system work (this also includes antibiotics in fish food and plant supplements, obviously). The bed is then waterproofed using non-toxic caulking or many simply cover it with a piece of the black plastic you can buy in rolls at Home Depot. I’m familiar with one commercial grower who successfully operates a commercial bioponics greenhouse utilizing tanks that are recycled bathtubs. The pipe from the tank is normally plumbed into a perforated, PVC manifold. The manifold then is hung a few inches above the plant bed allowing the water to flow through the air a bit, over the plants and into the bed where the plants can use their root system to uptake the nutritious water. Four or five inches of pea-gravel is placed into the plant bed to serve as the growing substrate. While some mix a water retaining/aeration substance, such as commercially available clay pellets, vermiculite or sometimes perlite into the pea gravel, we find this to be unnecessary-the pea gravel works just fine by itself. The bed is tilted down on one end toward the fish tank. The water flows over the plants, filters through the gravel where it meets a lot of beneficial bacteria and flows to the lower end of the bed and through an outlet pipe via gravity back into the fish tank. Fish need oxygen, of course. They take it in from the water and this oxygen must be replaced. But, there are two (sometimes more in some systems), quite simple but effective aeration methods we are building into your system. The first is at the plant beds where the water feeding it is allowed to fall through the air a few inches before it reaches the bed. The second is, as the water flows back to the tank, the pipe is suspended above the water level allowing it also to have several inches of air-fall before it reaches the water surface. Some growers go a step further and place a showerhead on the end of this outlet pipe. We’ve never tried this, but it can’t hurt. We did learn one valuable lesson early on. When the water leaves the growing bed, it tends to pick up all kinds of “junk” from this area of the biosystem: wood chips, dirt, stems, small particles we didn’t know were in the gravel, etc. This matter will accumulate in the fish tank causing additional labor to keep it clean (difficult when the tank is full of fish). We solved this problem (and I’ve noted that other growers have adopted this idea) by placing another water tank, a sump, between the water return from the growing bed and before the water is returned to the fish tank. The water is then pumped from this sump tank back to the fish. We simply cut a plastic barrel in half to make ours. Foreign matter will then accumulate in the sump and it can be cleaned or dumped as needed. You can also install an additional showerhead here if you want a third aeration device. You will, of course, lose a small amount of water from the system due to evaporation and the transpirational pull of the plants. Just top off the fish tank as needed with your garden hose, or if you are like us and hate unnecessary work and worry, you can jerry-rig a system using a toilet float and valve to keep the water at the same level automatically. In nine to twelve months, you will have grown Tilapia fish from fingerlings to harvest and will have enjoyed (hopefully) multiple healthy vegetables and/or decorative plants that have thrived on the natural, nutritious fish waste. But let’s examine our biosystem from a scientific aspect for a moment so we can grasp the big picture. We are allowing Mother Nature to do what she does best by giving her the methodologies, through our system components, that she needs to operate, yet also directing her in that she will work to produce the results we want her to achieve. We are taking advantage of nature’s nitrogen cycle along with a few other natural processes. Nitrogen is a necessary element common to all organisms on Earth. Nitrogen cycles through various chemical processes in our environment and is eventually taken in and consumed by living organisms. It is also sometimes excreted by one species of organism in different forms useful to yet other species. Among these nitrogen “fixing” organisms are the beneficial bacteria I’ve referred to previously. Our bioponics system is also a cycle. It survives by circular procedure and we could begin at any point within it to look at its nitrogen cycle, but let’s start with the fish waste. Ammonium, NH4, is a nitrogen molecule contained in the excretions. Have you ever walked into an older chicken house and smelled ammonia? My family used to keep wheat-straw on the floors of our chicken houses and change it periodically to keep the odor down and to provide a clean environment for the chickens. This also happens in fish tanks when fish waste is allowed to accumulate. And, if we don’t provide some sort of filtration system to remove it, the fish will simply die from poisoning and very quickly so, when we consider the number of fish we are trying to raise in a relatively small tank. But this is not a pollutant to our bacteria. The water containing the ammonium (along with many advantageous nutrients that plants need to be healthy) is pumped to the plant bed and cool things begin to happen. The gravel naturally contains beneficial bacteria known as nitrifying bacteria and they convert the ammonium into nitrates that the plants just love. This cleans the ammonium out of the water and it returns to the fish refreshed and ready for them to use again. The fish eat the algae and whatever other plant-based food you feed them containing the nitrates and excrete more ammonium for the bacteria to work on. And so goes the circle of life in a biosystem. In a greenhouse, sunlight is allowed in for the plants to enjoy in their photosynthetic process. The plants utilize the carbon dioxide that the fish have “exhaled” in their respiratory process and then the plants “exhale” oxygen into the atmosphere. Atmospheric oxygen is absorbed into the water when we aerate it, the fish then use the oxygen from the water and “exhale” more carbon dioxide for the benefit of the plants. Everybody’s happy inside our biosystem, the fish the plants-including the algae, Mother Nature and even some on the outside enjoying the quality, organic food that she and you have produced. That’s the gist of it. You could construct a small biosystem like this in a weekend once you gathered together the needed parts and a few tools. But some have taken this concept bigger… much bigger. Tom and Paula S. of West Plains, Missouri are among those who have made a good living from bioponics. They began several years ago by attaching a small greenhouse to their home. Today, they operate two large commercial greenhouses producing bedding plants, potted flowering plants, herbs, vegetables and they supply at least one large wholesale account with fresh, sweet basil. Their delicious, organically grown Tilapia fish are also in high demand both by individuals who buy directly from them and by several restaurants. 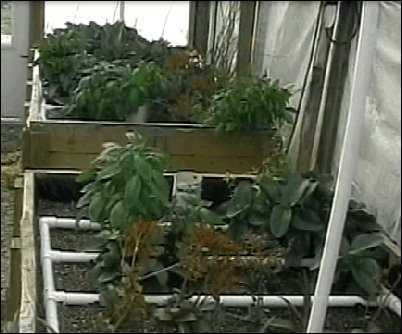 They have plumbed 1200-gallon fish tanks to multiple growing beds in the greenhouses. 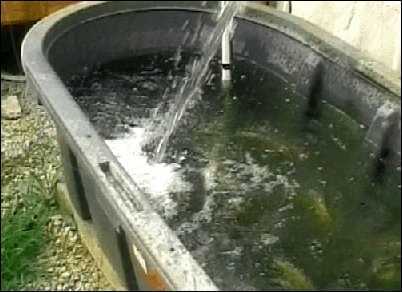 They report that the rich nutrients present in the water from their Tilapia tanks cause tremendous plant growth, even when the beds are planted 7 to 8 times more dense than one would attempt with another gardening method such as raised beds. In turn, the plants and beds remove over 90% of the of the fish waste according to tests they have accomplished on the system. An additional benefit is the tremendous thermal mass inherent in the water. They constructed the greenhouses in a way as to be doubled (a greenhouse within a greenhouse). This construction method provides an insulating airspace from the warmer or colder outside surroundings. They use only black tanks in the greenhouses, shaded from the sun in the summer and this all comes together to create structures that keep the plants and fish at a comfortable temperature year round without the need for additional heating and cooling. Also, those of us familiar with commercial greenhouses are aware that most employ a source of carbon dioxide such as a methane stove burning in the greenhouse for the benefit of the plants. The Spereanos state that this is unnecessary. The fish take care of it. So, does this article interest you enough to want to try it for yourself? It certainly isn’t difficult to put together this biosystem on a smaller scale as a food supply but perhaps you want to go bigger-go commercial-get on the money train. If this interests you, then I have some good (and free) advice: still start small. Get to know the business a bit before you invest time and money into unfamiliar territory. A washtub, a small bed built from plywood, a pump and some piping, a few fish and plants and a bit of gravel are all you need to learn the trade as you benefit from the organic food production. Finally, avoid scams. You may not have seen them out there if you aren’t familiar with the subject matter, but I certainly have. This sounds too good to be true to some, at least at first glance. Of course, upon closer examination, one discovers that it’s not too good to be true, it’s just a matter of understanding science and employing it. But there have been cases where con artists have told a story similar to the one I have in this article and then tried to sell a business “opportunity” to a gullible public. They assure them that this new business will make them rich, charging anywhere from $50,000.00 to $200,000.00 for the ticket to get there. Stay away from them. You don’t need their expensive liquid oxygenation systems. Plants give off oxygen on their own and we know how to flow the water through the air to absorb it so it can get back to the fish. And run the other way if they try to sell you a system of costly mechanical biofilters for your fish. That’s what the plant bed does. Your plants and gravel working in harmony become a natural fluidized bioreactor (a living biofilter) more powerful than anything they can sell you. These two sub-systems operating naturally within the overall biosystem are all you will ever need to succeed in this venture for fun, for food; or for profit.